There are other guides that cover this, but I found them lacking a bit in the step-by-step department for a beginner like myself. If you download the Cordova package directly from the Apache site, you’ll have to deal with the build process since it comes as source. It’s just all around easier to get started with the PhoneGap binaries. Follow the standard installation for the SDK, but after you finish, you will want to update your environment settings. First, add the path to the Java binaries to your Path variable (right click on Computer -> Properties -> Advanced system settings -> Environment Variables). If not, you need to double check your settings. Not much to see here as the install is straight forward. The installer will prompt you to run IntelliJ after it completes. 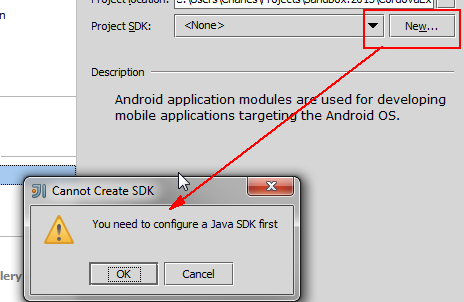 Click OK and select the location where the Java SDK was installed (C:\Program Files\Java\jdk1.7.0_04 for me). 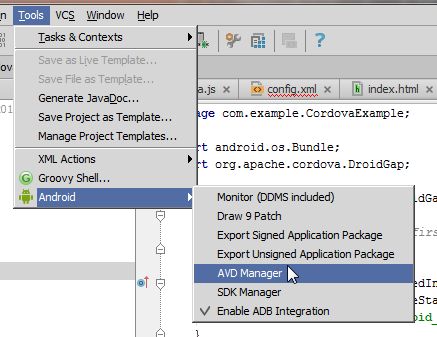 Once you select that, you will be prompted to select the location of the Android SDK (E:\Experimental\android\adt-bundle-windows-x86_64-20130911\sdk for me). It’s the same dialog, so pay attention to the title. Now that we have our project set up, we need to hook Cordova into it. 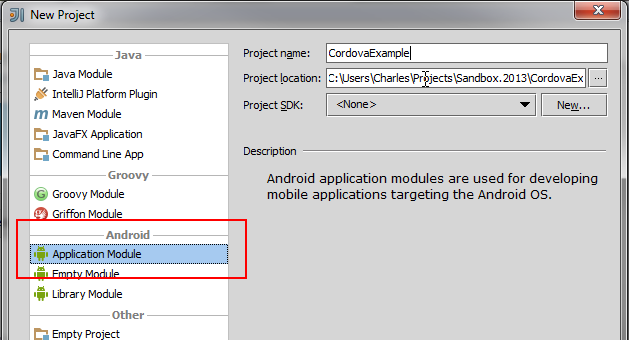 Find the location where you unzipped the PhoneGap binaries and go to lib\android; you will find cordova.js and cordova-2.9.0.jar here. 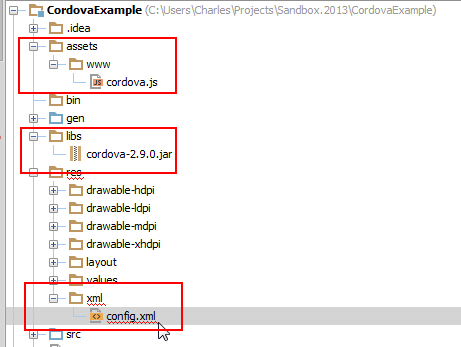 Under the assets directory in the project, create a directory called www and paste the cordova.js file here. Under the libs directory, paste the cordova-2.9.0.jar file here. You need to right click on this file and select Add as Library. You’ll noticed that even though the directory is assets\www, it must be androd_asset/www for the code to work. Accept the defaults and enter 10 in the SD Card Size. Now you’re ready to build and run. From the Build menu, select Make Project. 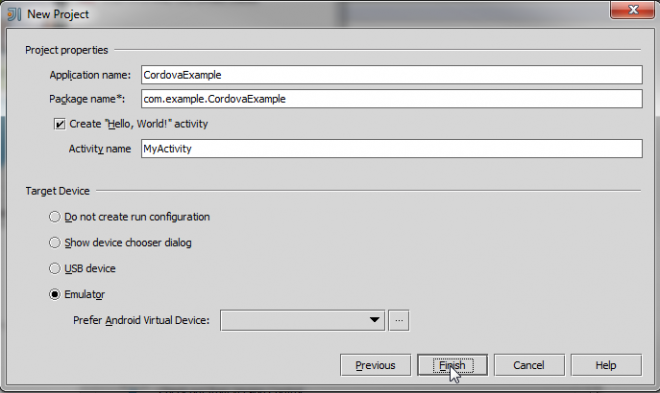 Once this completes successfully, click on Run -> Run ‘CordovaExample’. The cool thing is that as you update your code and build, IntelliJ will automatically push the changes to the virtual device. Next story Is Social for the Enterprise Useless?